*I just love these candy-colored drops from the Loulou de la Falaise jewelry collection. They’re only $150 and come in a variety of color combinations. They’re also available in clip-on versions for those of you without pierced ears. **This is at the top of my wish list. Not only am I crazy about the off-the-shoulder silhouette, I love the blue flowers against the vibrant poppy background. To say it’s been a whirlwind week would be an understatement — and I’m sure you gathered that, given my lackadaisical posting schedule! 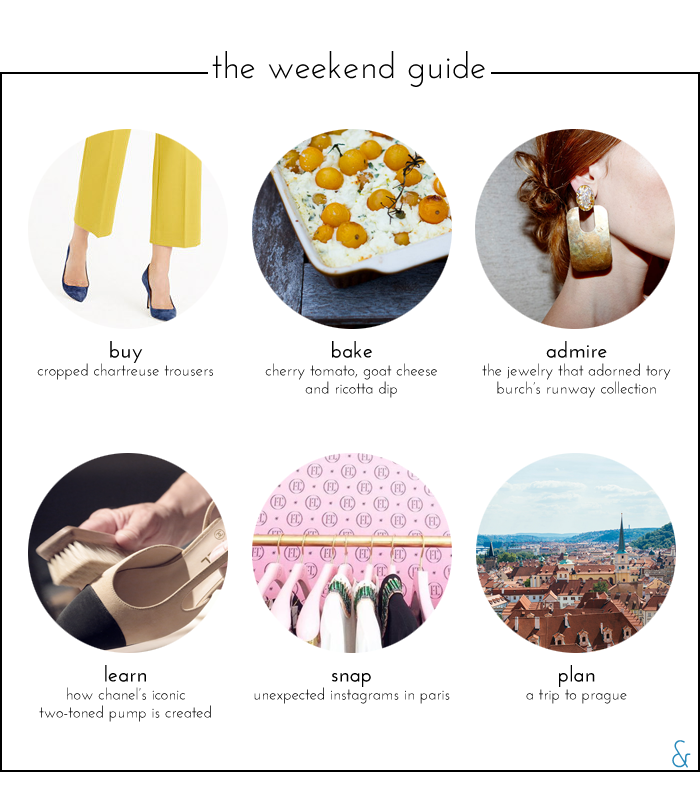 September and October are my busiest work months, so I’ve decided to start posting “The Weekend Guide” a day earlier to give myself more time to get out and enjoy every moment of the weekend with out the pressure of hitting “publish” first. Don’t fret, Friday’s regularly scheduled “Five Finds Under $55” hasn’t disappeared. You’ll find the week’s best budget pieces below. Of all of things to purchase for fall, chartreuse pants top my list. They’re ridiculous, but I can’t help thinking about how cute they’d look with a navy sweater and my beloved mint pumps. Make football Sundays better with a baked cherry tomato, goat cheese, and ricotta dip. 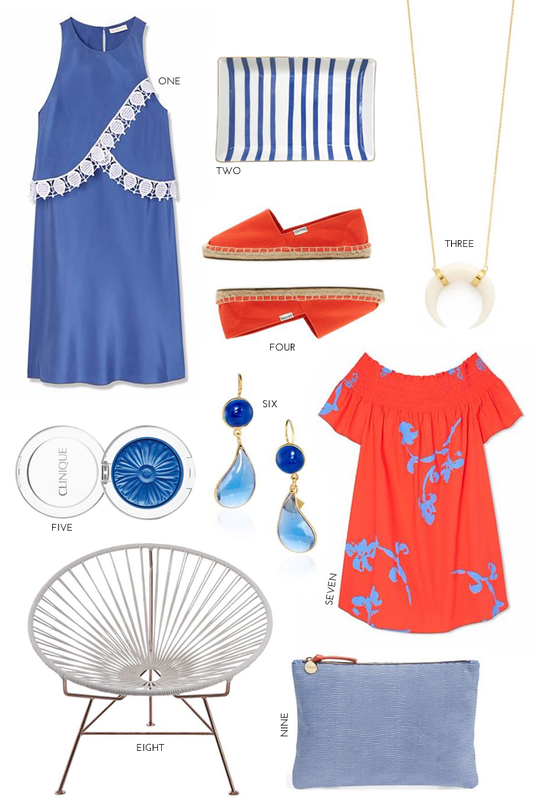 It’s no surprise that I loved Tory Burch’s spring collection (this!). As always, I’m obsessed with the accessories. Visit her blog to see close-up shots of the jewelry, shoes, and bags that stole the show. Chanel’s iconic two-toned pump in 1957. See how it’s made today. An Instagram of the Eiffel Tower is a must in the City of Light, but photos at these locations will give your followers an unexpected tour of the city. Prague is on Dave’s must-visit list. I’m loving Merritt’s mini travel guide. The biggest reason I love D.C. This week’s most coveted pieces. Pausing at the Spanish Steps. Still swooning over these loafers. Is there really such a thing as too many necklaces?